Two rare autobiographical works in one volume , founder of Fascism and dictator over Italy for twenty-one years. 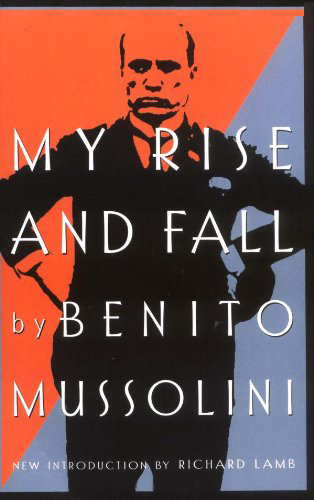 Here, for the first time in one volume, are two rare autobiographical works by Benito Mussolini (1883–1945), founder of Fascism and Italian dictator for twenty-one years. The first volume (published in English in 1928 as My Autobiography) describes Mussolini's youth, years as an agitator and journalist, experiences in World War I, the formation and revolutionary struggles of the Fascist Party, the March on Rome, and his early years in power. The second volume (published in English in 1948 as The Fall of Mussolini) was written during the brief period between his rescue by the Germans in September 1943 and his execution by Italian partisans in April 1945. Here the Duce recounts his last year in power and the coup d'état that deposed him. My Rise and Fall allows readers to view the dictator from two unique vantage points: Il Duce, eyes on the horizon, chin thrust forward, as he nears his political zenith; and Mussolini at his nadir, a desperate, powerless, sawdust Caesar, soon to be shot and hanged, head down, for all to scorn.